you’ve got BeachEast. One thousand tons of sand on Stratford Waterfront beside the Former Olympic Stadium is making BeachEast Britain’s Bondi this summer. 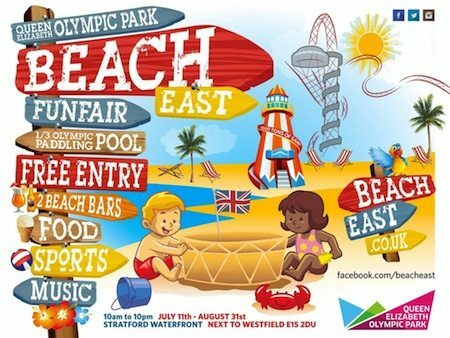 The UK’s largest urban beach by far features a vast area of fine, deep sand, a huge kid’s paddling pool, funfair rides, two beach bars and a host of sporting events and activities. Friends and families are enjoying FREE fun and sunshine at East London’s sizzling new summer attraction. For a chance to win £1000 at BeachEast click here to Like AND share our facebook page. To check out more summer activities in the Queen Elisabeth Olympic Park click here. Previous Post:Best day ever in Viccy Park and more to come! Next Post:Like it or loathe it Tescos is nearly here.